China and India’s rivalry threatens peace in the Indian Ocean basin. It’s also sparking a needed flood of development. On Monday, just hours after Air Force One touched down in India, the secret service quickly shuttled a jet-lagged President Obama to New Delhi’s Rajpath or “King’s Way.” There, Obama and Prime Minister Narendra Modi watched India’s finest military hardware parade through the heart of the city. It’s not the first time the president has taunted China to score political points. But that gesture, and Obama’s decision to meet with Modi twice in the span of four months, shows that the White House is becoming increasingly invested in India. Over the past decade, with America’s focus trained on Iraq and Afghanistan, China and India’s rivalry in the Indian Ocean has intensified, with competitive investments in ports, docks, and trans-shipment facilities along the basin. Washington has a deep interest in keeping the peace: the ocean is the go-between for 70 percent of the world’s oil. For India, the ocean’s endless histories and myths do much to invite fascination and boost the price of waterfront real estate. Mercantile contentions drive China’s interest. Xi Jinping has fastidiously cultivated relationships with India’s neighbors to pursue under-the-radar development projects around the basin. That includes modernizing Bangladesh’s bottlenecked Chittagong Port and Cox’s Bazar. China’s expanding defense budget also allows the People’s Liberation Army (PLA) to be more assertive around the basin. Beijing has become the world’s fifth largest arms exporter, disbursing $2 billion in weapons each year. The glut of guns and money has allowed China to project power deeper into the region, sending a surface action group into the eastern Indian Ocean in early 2014 and two PLA submarines to Colombo, Sri Lanka, in October. In principle, however, China tries to look like a dignified global citizen. A 2013 defense ministry white paper titled “The Diversified Employment of China’s Armed Forces” calls for compliance with the U.N. Charter and deploying troops in lockstep with local laws. Many of China’s ambitions in the Indian Ocean over the next decade are logistical, including agreements for refueling, replenishment, and low-level maintenance. China may be more interested in securing oil routes, vulnerable to lingering conflicts in the Persian Gulf and pirates in the Strait of Malacca, than offending India. None of those ideas are written in ink. Beijing’s relationship with Pakistan, India’s bitter enemy, is almost purely military. Since a 2008 agreement escalated ties, Pakistan has leaned on the PLA to supply nearly two-thirds of its aircraft and three-quarters of its tanks. Islamabad has given China free rein at Gwadar, a prime warm-water port at the edge of the Persian Gulf. Beijing has proliferated naval vessels to other allies in the Ocean, too, selling two Ming class submarines to Bangladesh for $203.3 million for a 2019 delivery. India is also fielding a world class Navy, and funneling boatloads of money into major facilities along the rim. After China’s submarine incursion in Sri Lanka last year, India pledged to bolster its military technology, spending $8.1 billion to purchase six diesel electric submarines. Sittwe, one of Myanmar’s busiest ports, has received an Indian-sponsored facelift to the tune of $100 million. It’s part of the Kaladan Multi-Modal Transit Transport Project, a larger development that includes the construction of an inland waterway on the Kaladan. Sagar, where India has installed missiles, will also be the site of a new deep-water port. India’s Navy and mariners can readily control maritime traffic in shipping lanes, and also possesses an easy route to the Strait of Malacca, the world’s second largest oil chokepoint. All of that pressure may not be necessary. China and India don’t dislike each other as they do the Japanese and the Pakistanis. Their economies are deeply intertwined. Xi warmly toasted Prime Minister Narendra Modi in his September visit to India, and inked business deals and investment promises worth around $20 billion dollars. 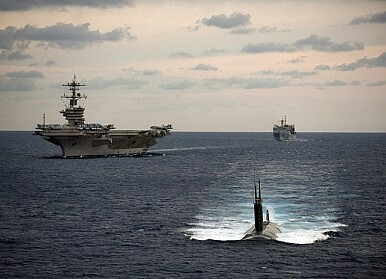 Competition at sea is a byproduct of competition on shore. Some of the deepest Sino-Indian tensions circle around Tibet. China asserts sovereignty over Aksai Chin, in Kashmir, and Arunachal Pradesh, near the Tibetan Plateau. In 2009, China and India agreed to set up a hotline between heads of government in both countries, after a conflict over the status of Arunachal Pradesh. That still hasn’t happened. Regular diplomatic communication would be welcome. Things seemed to move in that direction last year. India and China signed a Border Defense Cooperation Agreement (BDCA) — a bilateral agreement meant to prohibit the use of force, particularly along the line of control in Tibet. The BDCA also called for meetings of border personnel, high-level defense representatives, and the creation of an annual defense dialogue. Unfortunately, it has done little to change the status quo. Although competition over the Indian Ocean has widened the rift between Asia’s two biggest powers, it has proven fruitful for a strategically critical and often overlooked region. Bangladesh, Myanmar, and Pakistan, long neglected by investors, have received much needed development money. Port facilities in South and Southeast Asia are getting more efficient: Chittagong, Sittwe, Gwadar, and Sagar could be the foundation for a robust shipping economy in the region. Though competition could hurt stability, China and India have charted a course for the development of the region. Barack Obama’s visit is the greatest indication yet that the world is taking notice. Jack Detsch is a writer, radio journalist, and researcher in the San Francisco Bay Area. He can be found on Twitter @JackDetsch. Where Is the 'String of Pearls' in 2015? Chinese military installations in the Indian Ocean are still a possibility, not a certainty.